Official website of Qbit Speedup Pro promotes the program as a tool that optimizes system performance. It claims to have optimization features like threats removal, registry error fixer, and modules that boost system startup. The same features are offered by dozens of similar products like Auto PC Care, Qbit System Care, One Click Speedup, and so on. Undeniably, these mentioned programs are rogue applications that originate from one developer. Qbit Speedup Pro is just a mimic of the previous versions and therefore it adopts most of the misleading scheme it implements in persuading users to pay for the registered edition. 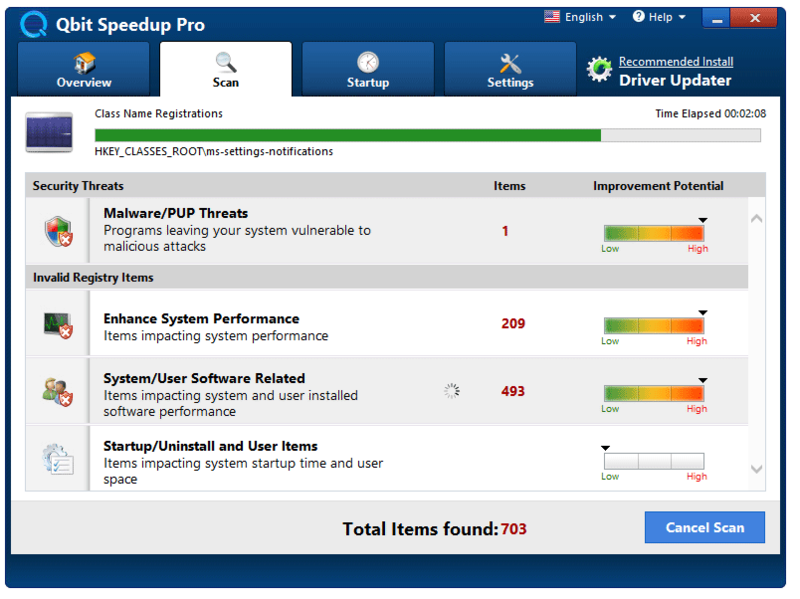 Qbit Speedup Pro is typically hosted on unknown websites where web users are redirected after visiting malicious web pages that masquerades as online system scanner. After checking web user’s computer, it will identify dozens of unwanted items and immediately notify that removal tool is needed to fix the issues. Subsequently, it redirects to web page where it process compulsory download and installation of Qbit Speedup Pro. Once fully installed, the rogue program will initiate a local scan and anticipate that it will provide results worse than previous online tests. At this point, the objective of this malware is to scare users and have them consider the purchase of Qbit Speedup Pro to repair the issues. The fake warnings and pop-up alerts will prolong until such time that user activates the program through online payment processing website. Keep in mind that aside from disbursing payment for the worthless system security and optimization tool, victim’s banking detail is also at risk because all the information used during online transaction are already in the possession of Qbit Speedup Pro creators. They may misuse collected records for succeeding fraudulent transactions. Therefore, if presence of Qbit Speedup Pro is observed on the computer, the first thing to do is remove the rogue application and never submit banking details on its website. 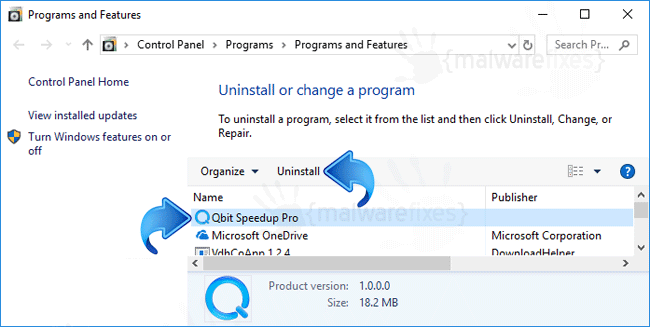 Full guide to get rid of Qbit Speedup Pro is provided below along with effective anti-virus and anti-malware tools. 2. Add/Remove Program window will open. Select Qbit Speedup Pro from the list. 5. The tool will start scanning the computer. It will prompt when it finds Qbit Speedup Pro and other malicious entities. Follow the prompt to proceed with the removal. 3. After downloading the file, Windows will prompt that download has completed. Click Run to start scanning for Qbit Speedup Pro . Another option is to browse the location folder and double click on the file to run. 5. Next, you will see Scan Type. Please choose Full Scan to ensure that all Qbit Speedup Pro entities and other harmful files left on the computer will be found and removed. For advanced computer user, you can opt for Customized Scan, if there are other drives or folders you wanted to include in this scan. 8. When removal procedure is complete, you may now close Malicious Software Removal Tool. We hope that Qbit Speedup Pro have been completely deleted from the computer. Please restart Windows to proceed with the normal operation. 6. Next, click on Threat Scan. This is the most comprehensive scan method that will surely find any hidden items linked to Qbit Speedup Pro.